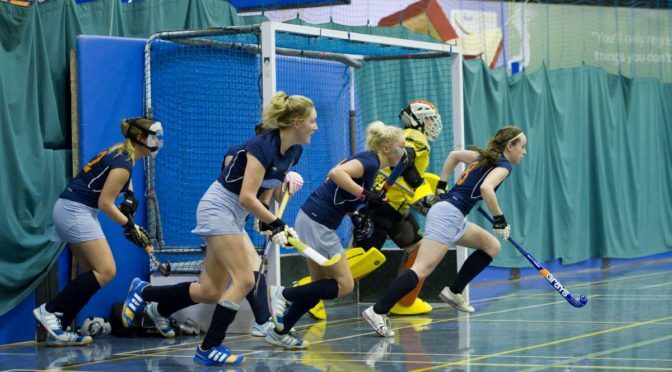 Crunch time for both M1s and L1s indoor teams who feature in our ‘Weekend Preview’. Clydesdale Men’s 1s start their round of crossover games in Men’s National Indoor Division One at Bell’s Sports Centre, Perth. Following a draw and a win last Saturday, ‘Dale finished fifth in MNIL 1 to place themselves in a crossover group with league leaders, Grove Menzieshill 1s. Their other opposition are Kelburne 1s, who the M1s play in their first game of the day from 10.10am, and Grange 1s, their second and final game of the day from 12.55pm. The unpredictability of the crossover games means Clydesdale could qualify for a Semi-Final place in Indoor’s Grand Finals if they pick up a series of positive results from their next three games. On the flip side, however, results going against ‘Dale could also see them drop into a Relegation Play-Off place. The M1s have three points in their name going into the crossover games. Points achieved against opposition from your respective group in the initial league season gets carried into the crossover pool. The three points achieved were against Kelburne 1s back in the start of December following a 9-2 win. But the following weekend, the boys were humbled 9-5 by their other opponents for tomorrow, Grange 1s. Clydesdale Western 6s play away at Old Anniesland to GHK 4s in Women’s West District Division Three from 2.00pm. The L6s are having a difficult time of it in the league. They only have four points to their name from twelve games, and are four points adrift of safety. The L6s were given an 8-1 hammering for the second time to Glasgow University 4s last week. This could be their best hopes of picking up points in Saturday’s clash given their opposition, GHK 4s, are just above the L6s by two points in the league table. Despite the results, Rachel Brewer’s side are mainly made up of young girls who are consistently improving their game each week and will be keen to turn their season around to avoid the dreaded drop. Clydesdale Western 1s will book a place at Scottish Hockey’s Indoor Gala Day if they can beat Watsonians in their Play-Off Semi Final meeting in Women’s National Indoor Division One on Sunday. The L1s booked their Semi Final place following wins in their crossover group against Grove Menzieshill 1s and Edinburgh University 1s. The girls took spot following results elsewhere and will play second in the other crossover group – which incidentally was Watsonians 1s. ‘Dale Western will first have to complete formalities in the crossover group by playing CALA Edinburgh 1s from 10.55am at Bell’s Sports Centre. The L1s will then take on Watsonians 1s from 1.15pm in their bid to regain last season’s indoor title. The two sides met in the league games, which saw Clydesdale Western prevail to a 4-1 win back at the start of January. The winner of the Semi Final will then qualify for Scottish Hockey’s Indoor Gala Day on Saturday 2nd February at Bell’s Sports Centre. Clydesdale Western 2s will start their crossover group in Women’s National Indoor Division Two at DISC on Sunday. The L2s will face Inverleith 1s from 9.15am, before taking on Granite City Wanderers at 12.55pm. The L2s already have six points to their name, so a win against either Inverleith or Granite City Wanderers 1s will most likely assure them of a Semi Final place in the Grand Play-Offs in WNIL 2. ‘Dale Western 2s can not promote from WNIL 2, however, as the league they are in is as high as they are allowed to play in. Clydesdale Western 5s will hope a win against Kelburne 3s at Glasgow Green on Sunday can lift them into the promotion spots in Women’s West District Division Two. The L5s have had a superb run of form of late. Five wins from their last seven league games – including currently three wins in a row – have taken the L5s up to third in the league, only goal difference behind Uddingston 2s. Trish Lonergan’s side, who were impressive in their win against Giffnock 1s last week, will be reliant on results elsewhere in order to go second by the end of their game against Kelburne 3s, which starts at 1.15pm.